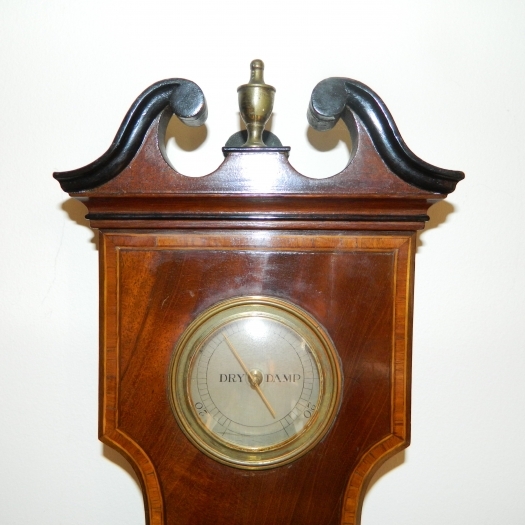 A good Georgian mahogany banjo barometer for sale by Dollond. 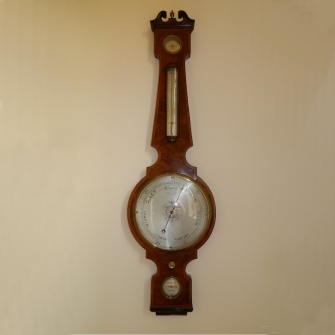 Exceptional original barometer by a good maker. This larger than usual piece is in fabulous original condition. It has never been restored and has traces of the original gilding to the cast, Sheraton style bezel. 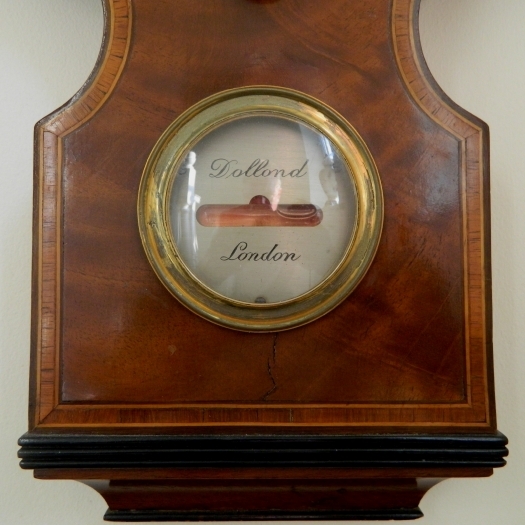 It is well proportioned with a swan neck pediment, hygrometer dial, mercurial themometer in a bow front box, a beautifully engraved, top quality 10 inch silvered barometer dial and a lower mock spirit level dial bearing the maker's name "Dollond" of "London". The case is well figured mahogany with satinwood crossbanding and stringing and has kept its colour surprisingly well. 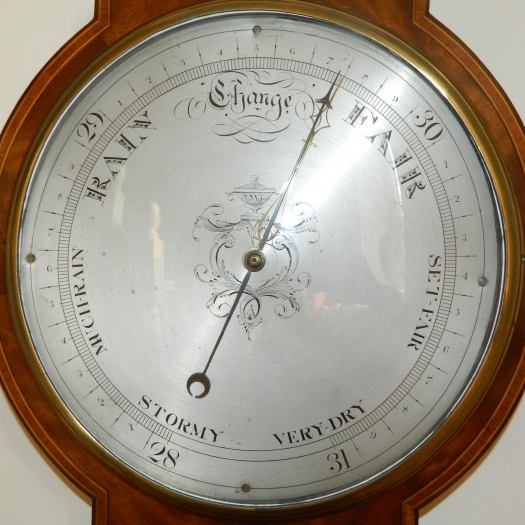 There are no chips or damage and the whole barometer only has minor imperfections. 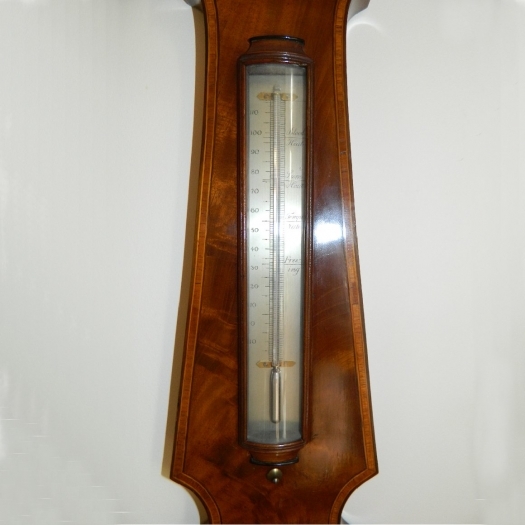 It is a joy and almost impossibility to find a barometer that has not been damaged or restored and it is working well. It is in such fine condition that it would be a shame to work on it other than give the case a dust and a wax polish. * George Dollond was born in 1774 and in partnership with Peter Dollond who died in 1820. George continued the business alone until his death in 1856. He was Instrument maker to King William IV and Queen Victoria. 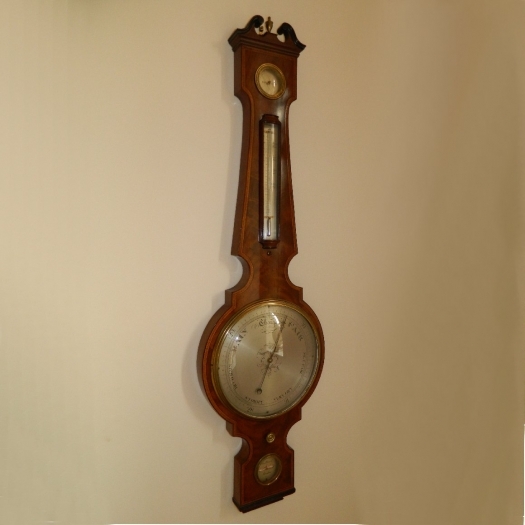 This barometer is a collector's dream because of the condition. Dimensions: 44" high x 12" wide.